I don't believe any child should go without shelter, food and basic medical care so I will start donating a portion of our sales to charities. Through your continued support our charity program has been able to expand significantly in the past few months. Donations so far: $292.45. THANK YOU!!!! 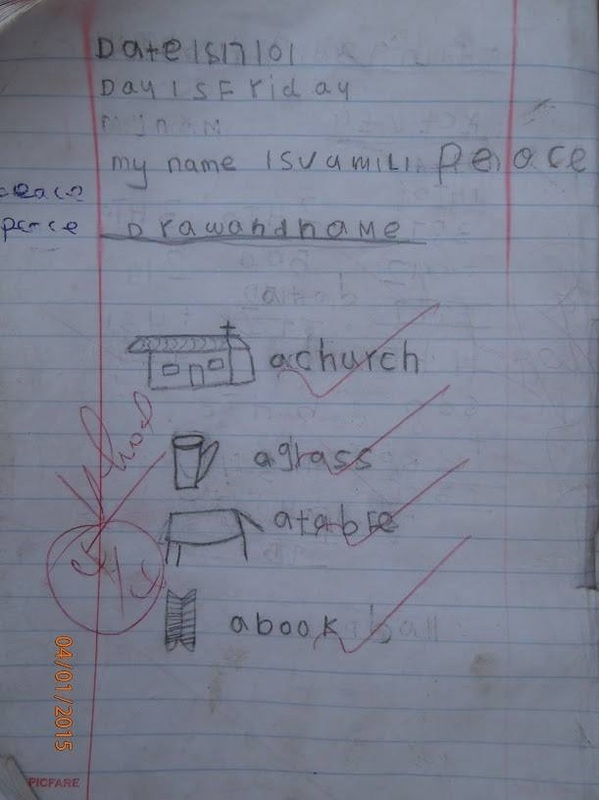 Peace is a 13 year old orphan of war displaced from the Congo into a refugee camp in Uganda. 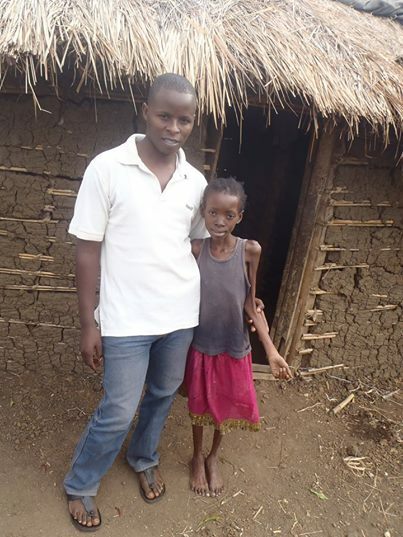 She has AIDS and TB and needs our help. My name is Peace Vumilia and I have AIDS and TB. I am 13 years old and came to the Kyangwali Refugee Camp as an orphan of war. I am Congolese, Batiringa (Pygmy) by tribe. I am living in Marembo Village. 11/1/15 - We have been keeping in touch and helping Peace for a few months now and the change in her is unbelievable. Peace is happily living with her sister Lydia (and extended family). During the Christmas period they were sent additional funds which they used to buy 50kg of potatoes and soap (pictured top right). 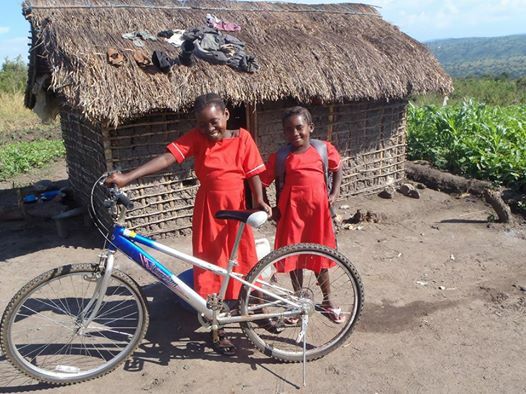 With your help we have also been able to contribute to Peace and Lydia's education. The girls will be re enrolled in school again this year. Thank you! Donations so far: $590.74 THANK YOU!!!! At present Familia Moja Children's Home provides food and shelter for orphaned and vulnerable children but their vision is greater than that. They see these children growing into influential adults, who through the education provided by Familia Moja, will give back to their community of Mang’u and Kenya as a whole. Their aim is to work within the community to set up sustainable development projects which both support the orphanage and benefit the community. Their Mission is to provide a safe and secure home for children within Kenya who have been orphaned by diseases such as AIDS, Malaria and Tuberculosis or who are vulnerable due to poverty. Provide children with: a nourishing diet, appropriate accommodation, clothing, access to healthcare and quality education, while ensuring that they receive the physical and emotional care required to become healthy, successful and fulfilled adults. Familia Moja works together with the community to improve the lives of not only the children within its care but also the community as a whole. Their Vision is to empower the children and their community to achieve their goals and create possibilities for their future; be it educational or entrepreneurial. Familia Moja is One Family and together we work towards a certain future. Donations so far: $425.78 (70 bed nets). THANK YOU!!!! 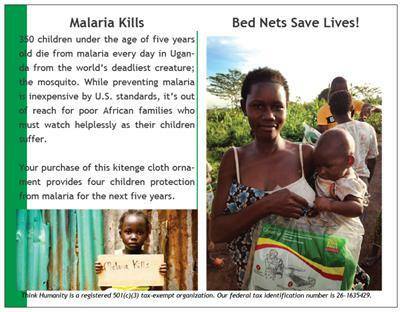 Think Humanity began giving out Long-Lasting Insecticide-Treated Bed Nets (LLIN) in 2007.The next donation will be to those refugees who have not received new nets for the past 5+ years. As the need for these life-saving nets continues, we hope you can stand next to us on our malaria-fighting mission again this year. This Christmas, we are asking for your help to replace 3,000 mosquito nets that were given to Congolese and Sudanese refugees six years ago. It is so important to continue to protect these families. As you shop you will notice that I donate 10% of sales to our charity programs. I am also more than happy to directly pass on any donations you would like to make to any of the organisations. Please contact with at contactethicalliving@gmail.com. If we work together we can make a real difference!